This article is about the fashion designer. For his company, see Armani. Armani was born in the northern Italian town of Piacenza, where he was raised with his older brother Sergio and younger sister Rosanna by his mother Maria Raimondi and father Ugo Armani (an accountant for a transport company). While at secondary school at the Liceo Scientifico Respighi in Piacenza, Armani aspired to a career in medicine, particularly after reading A. J. Cronin's The Citadel. He enrolled in the Department of Medicine at the University of Milan, but after three years, in 1953, he left and joined the army. Due to his medical background, he was assigned to the Military Hospital in Verona, where he would attend shows at the Arena. He eventually decided to look for a different career path. After his stint in the armed forces, Armani found a job as a window dresser at La Rinascente, a department store in Milan in 1957. He went on to become a seller for the menswear department, in which capacity he gained valuable experience in the marketing aspect of the fashion industry. In the mid-1960s, Armani moved to the Nino Cerruti company, where he designed menswear. His skills were in demand, and for the next decade, while continuing to work for Cerutti, Armani also freelanced, contributing designs to as many as ten manufacturers at a time. In the late 1960s, Armani met Sergio Galeotti, an architectural draftsman, which marked the beginning of a personal and professional relationship that lasted for many years. In 1973, Galeotti persuaded him to open a design office in Milan, at 37 Corso Venezia. This led to a period of extensive collaboration, during which Armani worked as a freelance designer for a number of fashion houses, including Allegri, Bagutta, Hilton, Sicons, Gibò, Montedoro, and Tendresse. The international press was quick to acknowledge Armani's importance following the runway shows at the Sala Bianca in the Pitti Palace in Florence. The experience provided Armani with an opportunity to develop his own style in new ways. He was now ready to devote his energy to his own label, and on July 24, 1975 he founded Giorgio Armani S.p.A. in Milan, with his friend Galeotti. In October of that same year, he presented his first collection of men's ready-to-wear for Spring and Summer 1976 under his own name. He also produced a women's line for the same season. Armani established an innovative relationship with the fashion industry, characterized by the 1978 agreement with Gruppo Finanzario Tessile (GFT), which made it possible to produce luxury ready-to-wear in a manufacturing environment under the attentive supervision of the company's designer. In 1979, after founding the Giorgio Armani Corporation, Armani began producing for the United States and introduced the Main line for men and women. The label became one of the leading names in international fashion with the introduction of several new product lines, including G. A. Le Collezioni, Giorgio Armani Underwear and Swimwear, and Giorgio Armani Accessories. In the early 1980s the company signed an important agreement with L'Oréal to create perfumes and introduced the Armani Junior, Armani Jeans, and Emporio Armani lines, followed in 1982 by the introduction of Emporio Underwear, Swimwear, and Accessories. A new store was opened in Milan for the Emporio line, followed by the first Giorgio Armani boutique. Armani's concern for the end user culminated in the development of a more youthful product with the same level of stylistic quality as his high-end line, but at a more accessible price. Armani's men's and women's skiwear and ski casualwear line was developed in 1995. His 1991 project, A/X: Armani Exchange, represented Armani's attempt to break into the American mass market, offering lower prices for the relaxed chic clothes. In 1996 his long-time friend Eric Clapton composed some songs for Armani's fashion shows and has since dressed in Armani. Later that year Clapton opened two Emporio Armani stores in New York City. In 1998 Armani hosted a party for Clapton Crossroads guitar auction. He also prepared to break into the Chinese market by opening up his first store in that country in 1998. The small shop in Beijing was followed by a flagship store in Shanghai in 2004 and plans for 40 by 2011. In 2000, Giorgio Armani SpA was introducing new lines of cosmetics and home furnishings, and expanding its line of accessories. At the same time, the Guggenheim Museum in New York hosted an exhibition of Armani's work – a first for a living designer – with average attendance of 29,000 a week. In 2008, Armani designed the bullfighting costume, called the "Goyesco", worn by Spanish bullfighter Cayetano Rivera Ordóñez at the "Corrida Goyesca" in Ronda, Spain. They have also collaborated on several fashion shows and other events. Armani has designed many stage outfits for pop superstar Lady Gaga, including those worn on her record-breaking Monster Ball Tour and Born This Way Ball Tour. He has also designed for many high-profile award shows, such as the 52nd Grammy Awards and the 2010 MTV Video Music Awards. Giorgio Armani and Emaar Properties PJSC signed an agreement in 2005 for Emaar Properties PJSC to build and operate at least seven luxury hotels and three vacation resorts under the Giorgio Armani name. Giorgio Armani would be responsible for overseeing all aspects of the interior design and style of the hotels. The Armani Hotel was opened in Burj Khalifa on April 27, 2010, comprising the bottom 39 floors of the supertall skyscraper in Dubai, United Arab Emirates; it has 160 guest rooms and suites, and 144 residences. Giorgio Armani is also designing the interiors of the Armani Residences, also within the skyscraper, and its specially designed line of products from the Armani/Casa home furnishings collection. Armani Musica presents Emporio Armani Caffè compilations, a series of special CD compilations curated by Giorgio Armani with dj-sound designer Matteo Ceccarini, offering an eclectic mix of conceptual sounds and underground rhythms. Giorgio Armani has a keen interest in sports. He is the president of the Olimpia Milano basketball team, and an Inter Milan fan. He has twice designed suits for the England national football team. He has since designed suits worn by players of the London club Chelsea since August 2007. He designed the Italian flag bearers' outfits at the opening ceremony at the 2006 Winter Olympics in Turin, and also designed Italy's Olympic uniforms for the 2012 Summer Olympics in London. Armani also designed and introduced the EA7 range, a brand inspired by Ukrainian footballer Andriy Shevchenko, who at the time played for A.C. Milan and wore the number 7 jersey. The Chelsea Football Club has commissioned Armani to create a new look for its Directors' Suite at Stamford Bridge. To be called the "Armani Lounge," the dining room and lounge area serves as the principal meeting place on matchdays for the Chelsea Board of Directors and for the entertainment of VIP guests. In total the "Armani Lounge" covers 200 square metres for which Giorgio Armani has personally designed a unique concept featuring furnishings from his Armani/Casa home interiors collection. Armani is an intensely private man, but has publicly identified as bisexual. He had a longstanding relationship with his business partner, the architect Sergio Galeotti, who died of a heart attack in 1985. ^ Craven, Jo (11 May 2011). "Giorgio Armani biography". Vogue. Archived from the original on 1 January 2011. Retrieved 11 July 2012. ^ "Giorgio Armani". The World's Billionaires. Forbes. March 2012. Archived from the original on 30 April 2012. Retrieved 30 April 2012. ^ "Giorgio Armani: the man who invented red-carpet dressing". The Daily Telegraph. 22 September 2014. Retrieved 20 April 2015. ^ Molho 2007, pp. 28–29. ^ Molho 2007, pp. 33–36. ^ Molho 2007, pp. 38–39, 41, 49. ^ "Giorgio Armani costume design drawings for AMERICAN GIGOLO". Margaret Herrick Library. Academy of Motion Picture Arts and Sciences. Retrieved 19 May 2015. ^ Eric Clapton Tourdates 1996 Where's Eric! ^ "Giorgio Armani Designs Costume for Cayetano Rivera Ordonez for The Corrida Goyesca". Armani Press. 29 July 2008. Archived from the original on 11 July 2011. Retrieved 12 December 2010. ^ "Giorgio Armani brings haute couture live to Internet". EnjoyFashion. 25 January 2007. Archived from the original on 22 February 2007. ^ "Armani hotel opens in Dubai's Khalifa tower". Jpost.com. Associated Press. Retrieved 2013-02-15. ^ a b "Armani Hotels, Resorts and Residences official website". Armanihotels.com. Retrieved 2013-02-15. ^ a b Alexander, Hilary (2003-05-19). "Armani turns England out in a style that will suit Beckham". The Daily Telegraph. London. Retrieved 14 July 2011. ^ "Giorgio Armani Biography". WhyFame. Archived from the original on 13 October 2007. Retrieved 14 July 2011. ^ PR Newswire on behalf of Giorgio Armani. "Giorgio Armani Presents New England Football Team Off-Field Wardrobe for European Championships". Retrieved 10 July 2011. ^ Barnett, Leisa (3 August 2007). "An Excellent Pitch". Vogue. Archived from the original on 23 February 2012. Retrieved 14 July 2011. ^ a b Aldern, Natalie (13 July 2011). "Armani to Design Italian Olympic Uniforms". Italy Magazine. Retrieved 14 July 2011. ^ "Chelsea unveil latest big-name signing". Daily Mail. 6 September 2007. ^ "Armani, Giorgio (b. 1934)". glbtq.com. Archived from the original on 27 February 2015. Retrieved 24 April 2015. ^ Will Giorgio Armani be the Last Fashion Designer? New York. Retrieved 24 April 2015. ^ Giorgio Armani and Sergio Galeotti: A Love Story LuxeMag, 21 July 2010. Retrieved 24 April 2015. Molho, Renata (2007). Being Armani: A Biography. Milan: Baldini Castoldi Dalai. ISBN 978-88-6073-296-5. Mackenzie, Suzie (11 December 2004). "The gentle touch". The Guardian. Retrieved 23 September 2007. McCartney, Stella (16 May 2006). "The wisdom of King Giorgio". The Independent. Archived from the original on 16 January 2009. Retrieved 23 September 2007. "Q & A: Giorgio Armani". The Scene. CNN. 3 October 2006. Retrieved 2007-09-23. Schinke, Amanda (7 October 2008). "Liar, Liar, Armani on Fire!". PETA. Retrieved 9 October 2008. 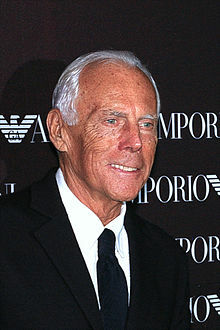 Wikimedia Commons has media related to Giorgio Armani.